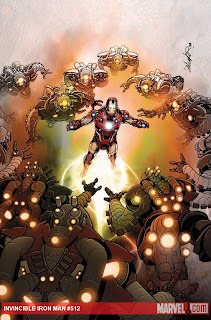 It's been a long time since I reviewed an Iron Man comic for the site so here goes. In this issue Tony Stark is somewhat on the run. After getting drunk during "Fear Itself" people have been asking themselves why are we letting a drunk pilot a four billion dollar suit of armor? After crashing in Times Square and having his armor mapped by a new upgraded version of the Living Laser, Tony Stark is taken to a New York City hospital. While trying to revive Stark from having a cardiac arrest using a defibrillator Stark breaks free from the hospital. Over in Mandarin City, the Mandarin has Ezekiel Stane create some new armored foes called the Dreadnoughts. I really like the part where Mandarin and Stane are talking and Mandarin keeps looking at his smart phone. Mandarin tells Stane that he has just over 24 hours to complete the Dreadnoughts. Stane tells the Mandarin that he needs more time. Mandarin uses on of his rings to change the way Stane feels and thinks so that he is totally in line with what the Mandarin wants him to do. While hanging out in a NYC coffee house Tony Stark is spotted my a police officer. The cop lets Tony know that since he crashed into Times Square less than 12 hours ago the police would like to bring him in for questioning. Tony asks if he's under arrest. When the cop tells him no Tony makes a break for it. Back at the Pentagon U.S. General Babbage wants the Iron Man armor turned over to the United States Defense Department. Colonel Rhodes learns that the Dreadnoughts are attacking the Three Gorges Dam in China and goes off to prevent a new world war.